The Modern Suite our premium suite split into three rooms a large lounge with wonderful view to the sounds, its contemporary surrounding make this an ideal place to relax, the lounge has a gas fire, plasma TV, IPod stereo system and beautiful furniture, though in the bedroom there is a super king bed with the most gorgeous of bed Linens with lots of cushions there is also a plasma for you to relax and watch sky movies. The bathroom has a wonderful open feel with a spa bath for two, large glass shower. Includes a glass of champagne, fruit & chocolate platter and a gourmet breakfast. 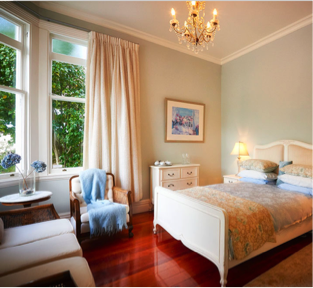 The Formal Suite delivers a rich romantic interior, from its high ceiling and antique chandeliers to its inviting super king-sized French bed or chic lounge with plasma TV. A beautiful French tub is situated in the middle of the bathroom plus the large corner shower. This is pure French style an exquisite rug decorating the immaculately polished wooden floor. 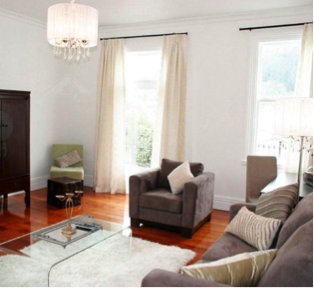 A door leads onto the outside balcony overlooking the beautiful inlet of the Marlborough Sounds. Including a glass of champagne, fruit & chocolate platter and a gourmet breakfast. The Sea Room invites you to hide-away in this romantic room. This room is decorated in creamy blue tones to create a relaxing environment. 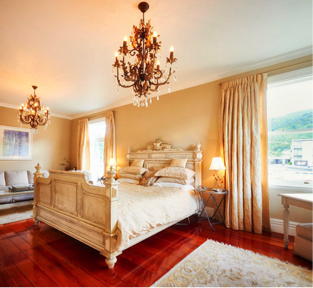 A queen-sized bed takes centre place on the beautiful polished floor. Relax on the wicker chairs by the bay window or watch T.V on the Plasma or take a soothing, fragrant bath in the French tubs. 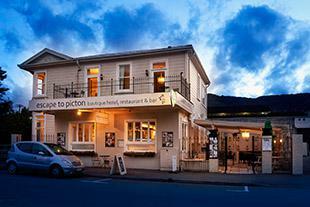 Escape to Picton is a boutique hotel & restaurant in Picton, New Zealand. The hotel is enviably sited by the town’s waterfront, overlooking the marina. 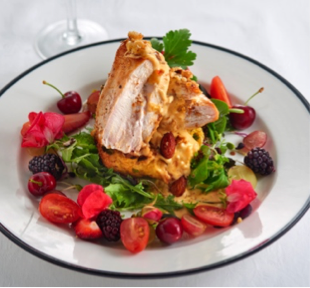 Escape Boutique Hotel has a fantastic in-house restaurant and bar with its clean lines and décor sure to impress. Service and looking after our guests needs are a priority to our staff. During the day we have a brunch lunch menu and a la carte menu in the evening, fresh seafood is a specialty. Wonderful deserts and great coffee. As required by New Zealand Law and as the well-being and comfort of all guests at Escape to Picton we are a non-smoking premises. Smoking is strictly outside only. The guest will be charged a prepayment of the total price anytime. Cancellations within 30 days of arrival date: 100% forfeit of the total booking price. A current credit card number with expiry date is required to confirm a reservation. In confirming the reservation, and providing the credit card details, the guest acknowledges and accepts the cancellation policy detailed below and authorises the charging of this card. 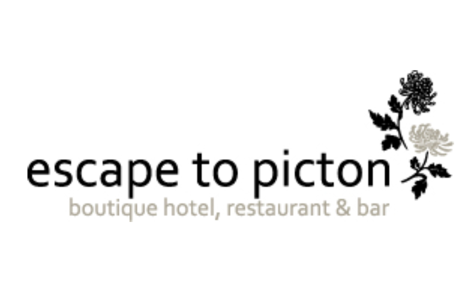 Due to Escape to Picton being a small Boutique Hotel cancellations affect us greatly. We adhere to a strict cancellation policy, if your reservation is cancelled 21 days prior to stay we will charge for the total (100%) accommodation value. We strongly advise guests to take out travel insurance to protect themselves against unexpected changes to their travel plans. Our normal check-in and check-out times are 3:00PM and 11:00AM respectively. Should you arrive early or wish to leave later, we are happy to store your luggage for you whilst you enjoy Picton or the surrounding areas.